Retaining clients is one of the best ways to keep your Virtual Assistant business steady and profitable. Yes, you shouldn’t forget about ongoing marketing to attract new clients, but if you keep your existing clients happy, you’ll better maintain a regular income and feel a lot less pressure. This first tip is more of a suggestion before taking on a new client, so falling slightly outside of the ‘client retention’ remit. But it’s a point worth making to help with client retention in the future. Taking on a new client – any client – is always a win, particular as a new VA. But whilst it may be important to build up your client base quickly, it’s wise to exercise a little restraint to check if they’re a good fit. This will help pave the way for a long and successful working relationship. What tasks will they want to outsource? How many support hours do they think they’ll need? Have they worked with a VA before? Knowing the answers to these questions, as a minimum, should help you decide if they are the right choice of client for you. If something feels wrong from the get-go – they’re demeanour, work requirements, expectations – you may be better off politely declining to avoid frustration or confrontation later down the line. Retaining a client who needs your support isn’t rocket science …. Provide a high-quality service offering good value for money and it’s unlikely they’ll ever want to jump ship. All common sense stuff, but it’s surprising how we can all become a bit complacent at times and dive straight in at the last minute only to encounter hurdles, when the client thinks it’s all in hand. Cover these points upfront, and you’ll have everything you need to deliver a quality job on-time. You don’t have to accept every task and every deadline a client throws your way if your workload is already stacked to the nines, but how you handle their request counts. First rule of managing multiple clients is NEVER say that you’ve got too much ‘other’ client work on so won’t be able to work on their task until X. Instead remain available and let them know that you have scheduled it in for X. The above two dates could be exactly the same, but the way you handled it from the client perspective is very different. And remember, once you’ve provided a deadline, stick to it. There are few things worse to a client than a deadline being agreed, only to receive an end-of-deadline-day email with excuses as to why it’ll be late. Your client doesn’t care if your cat had to be taken to the vet, your power was cut, or your daughter is at home with a tummy ache … well they may a little, but not if it means you miss deadline after deadline. Accept the work, agree the deadline, deliver. Of course, if you can squeeze in an urgent client request, then do. This always goes down well. It shows empathy of their need, as well as your professionalism and willingness to help out. All of which will help solidify your working relationship a little more. I always recommend asking for feedback from a new client after the first month’s trial – even if you don’t have an official trial period. Then again after three months, and thereafter twice a year. Not only does this give your client the opportunity to let you know if they have any niggles or preferred ways of working, but it allows you to do exactly the same thing. Tweaking ways of working in those earlier days will help finesse them for the long-term. Get this right and your client won’t ever want to look elsewhere for support. You may have started working with a client on a specific task or type of task and that’s how your working relationship has continued. But if you haven’t told them about your other services you’re missing a big trick. Let them know that you also create websites, develop and run email marketing campaigns, write content, manage social media accounts … whatever else you offer, tell them. They may never have realised or thought you were at capacity or just didn’t think about outsourcing, and you could win yourself more business. It’s always worth a shot. 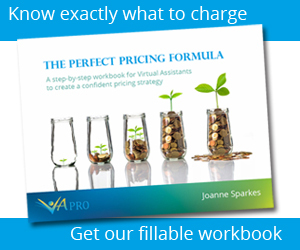 Deciding between hourly rates, retainer packages or one-off project fees can prove tricky. You don’t want to undersell your time and effort, or price yourself out of the running. But you may want to consider alternative package options to help retain clients. For example, you could be carrying out multiple tasks within the same field for a client. Could you bundle them up into one package with a set fee that offers good value, makes it easier for the client to know what they’re getting and paying, and ensures you get a set amount each time? Or perhaps you’re often billing around 20 hours per month for a client, although there are months when it falls below. Could you look at offering a 20 hour per month retainer package to guarantee that amount? Offering simple pricing solutions to meet your clients needs can be an effective way of keeping them onboard. The last tip should be an obvious one – keep in touch and nurture each client. Retaining clients is often about the relationship that you’ve built up with them. Making sure they feel valued and assured, as well as showing them you, rather than being just a faceless virtual assistant with no personality. The more they feel connected to you, and you to them and their business, the more likely they’ll want you as their VA above someone else. What do you do to ensure you keep hold of existing clients?